Regardless of the biking style one intends to engage in, a helmet will be an inevitable asset to have. 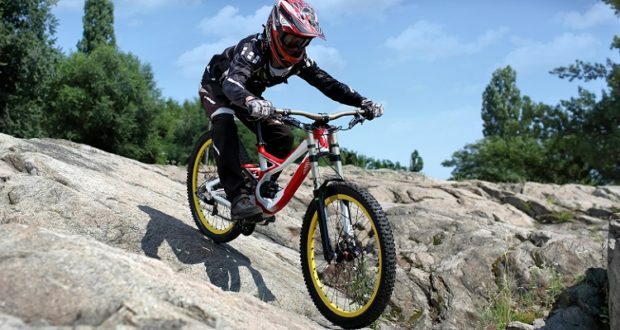 The question to ask is not whether to have one, but how to choose best mountain bike helmet for the activity. To make a viable decision on the helmet to have, one needs to consider factors like the terrain to ride on, the aggressiveness of the ride and the type of bike to ride among others. Since they cover the entire head, mountain bike helmets are known to be the most protective helmets. They are suitable for very rough riding where serious crashes are a common phenomenon. One should always try fitting the helmet before buying. This will ensure the rider gets the right fit. The rider should understand the terrain and riding style. This will ensure he gets the right helmet. Different terrains call for different helmets. One should avoid buying a second hand helmet because it is hard to know why the owner is disposing it – it could be having fractures in the liner or any other invisible damage. Safety is paramount in riding; one should always endeavor to have the helmet that will promise maximum safety. There are many features that are inherent in the numerous helmets available in the market. Outlined below are some of the features that one should to look into while selecting the best mountain bike helmet. Every rider requires a helmet that will give maximum comfort while at the same time assuring him safety and allowing excellent visibility. A helmet with minimum distraction will maximize concentration on one’s line. One needs to confirm that the helmet has the appropriate, dense and durable interior padding. The most recommended material for interior padding is velvet since it is exceptionally comfortable and prevents pressure points between the head and the polystyrene of the helmet. The ventilation of the helmet also determines how comfortable it is going to be. It should allow circulation of fresh air through the helmet to the head and out of the helmet, thereby avoiding heat buildup around the rider’s head. The front vents should be large to maximize air flow. Caution should however being taken when considering the ventilation of the helmet. This is because there is usually a trade-off between ventilation and safety. A helmet with more ventilation means either having more openings or fewer but larger openings, which will ultimately compromise the safety of the helmet. The helmet should also properly fit in the head. This will avoid it from shaking and clattering against the head as one rides through tough terrain. Typically, a nice helmet should have two to three height adjustments for the rear stabilizer to make it fit even better. Unlike half-shell helmets, the mountain bike helmets do not have the tightening mechanism at the back of the head. Therefore, one should carefully select one that is tight enough even without the said tightening mechanism. To ensure it fits, the rider ought to try before buying since different heads have different shapes and sizes. Before buying, one should also remember to check the chin strap and the extent it is capable of tightening the helmet. A heavy helmet will weigh down the rider and dismally affect his performance. A helmet doesn’t have to feel so cumbersome. It should however be noted that mountain bike helmets will definitely be relatively heavier than half-shell helmets for obvious reasons. One cannot completely sacrifice safety for a light helmet; just a little more weight will not hurt. The head is the most vulnerable, yet sensitive part of the body for a rider. In making a choice for the best mountain bike helmet, protection should be a critical factor to consider. One should make sure the helmet meets the certification standards set. It ought to have passed the scientific crash tests done by the certifying agencies. Before buying, the rider should check for certification stickers from relevant authorities. This will guarantee the rider maximum protection before engaging in that jagged ride. It should have a visor which is essential in shielding the rider from the sun, rain, or mud. The visor also protects the eyes from protruding branches or airborne rubbish. Technological advancement has seen some helmets being fixed with modern protection systems like Multi-directional Impact Protection System which increases the riders’ safety. Such are the details to look out for. As a bonus, a number of helmet manufacturers are nowadays fitting their helmets with cameras and light mounts. These features are not just cosmetic but add to the safety of the rider. In order to get the best deal, one needs to look out for some features that translate to durability of the helmet. A durable helmet will not have exposed polystyrene foam along the bottom edge; the foam should always be protected by being encased within the shell. Such a helmet will take extremely long to wear out. Also, the gasket should not separate from the chin guard where the rider holds the helmet when taking it off and off. The best material for the outer shell, which is known for its durability, is Polycarbonate. One should therefore be on the lookout for the material if durability matters to them. Here is some best full face mountain bike helmet with all the details.